The German High Command at War by Robert B. Asprey presents the First World War of 1914-1918 from the high viewpoint of the German generals who ran their side of the catastrophe. Most historians from the victorious Allied nations have concentrated on what seems most natural: if writing in English, on the British and secondarily French experiences; and for late in the war, adding the American experience. Since for Imperial Germany this was a two-front war, to understand German strategy we need to keep in mind that they were fighting France and Britain on their Western Front, and alongside their chief ally Austria-Hungary, fighting Russia on their Eastern Front. After Bismarck's prewar system of alliances for Germany broke down, Germany's only substantial ally was the none-too-strong Austro-Hungarian Empire, and it grew increasingly likely that Germany would have to fight a two-front war. The basic principle of German strategy thus became: hold on one front, concentrate and win decisively on the other, then switch back to finish off the first front. Field Marshall Paul von Hindenburg (1847-1934) and General Erich Ludendorff (1865-1937) made their reputations at Tannenberg and elsewhere on the Eastern Front against Russia. 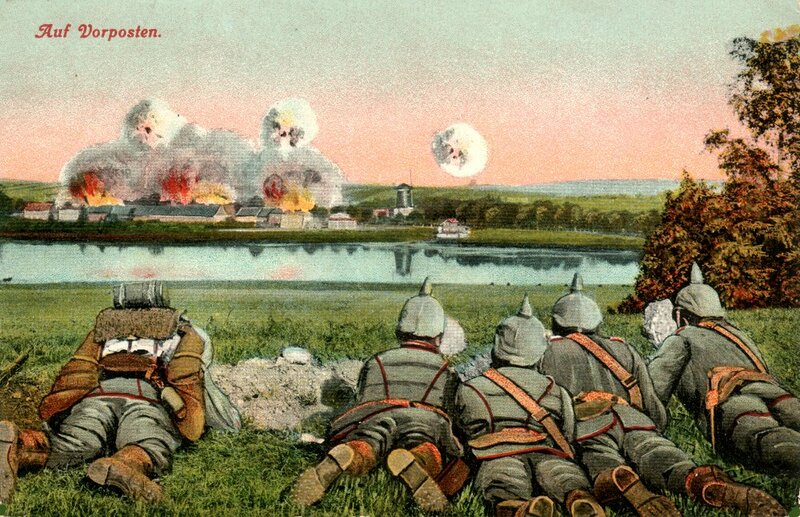 The Russian generals made more blunders than Hindenburg and Ludendorff as huge armies fought in difficult terrain such as the Pripet Marshes; Brusilov was perhaps their best general (reference the Brusilov offensive, 1916). While commanding on the Eastern Front, Hindenburg and Ludendorff were "Easterners", that is, advocates of concentrating forces against Russia and thereby gaining a knockout victory in the East first, only afterwards concentrating on the Western Front. By halfway through the war, Hindenburg and Ludendorff had maneuvered themselves to overall command of the German Army. They became "Westerners", shifting to advocate concentration against France and Britain, thereby winning in the West first. Robert Asprey's history of this process is excellently written, even with a little humor now and then — we might almost call this a war-gods' graveyard humor, the stakes were so high and the process so macabre. But some of this spirit helps in the study of the self-satisifed delusion and the on-going pompous determination that ordered millions to their deaths. The German High Command at War is a dual biography of Hindenburg and Ludendorff in the war years. Hindenburg provided the calm facade of the team (the "wooden Titan" — a reference to a fund-raising statue); Ludendorff provided the brains. It's quite funny just following Hindenburg's relations with his official painter who did many portraits while the Field Marshall supposedly was busy commanding German armies in the East. Hindenburg was quite concerned that portraits show the correct number of buttons on his uniforms. Asprey is very good at clarifying battle strategy, and scathing in his analysis of it. Very few generals on either side in World War I seem to have heeded a lesson foretold by the American Civil War, that the relative offense-defense strengths of the era had shifted decisively to the defensive. Assaults of foot soldiers against entrenched defenses with machine-guns penetrated only hundreds of yards, on occasion a few miles, at a cost of tens of thousands of casualties per day — or per mile. Shortly the forward thrust would bog down again. The high viewpoint is not necessarily the place from which commanders can see the whole picture, or real battlefields of mud and barbed wire. World War I is the classic war of chateau generals, sitting around their maps in comfortable headquarters twenty miles from the front, directing battle from the end of a telegraph line. Sending men to their deaths by the tens of thousands and ultimately millions, trying to wear out machine-guns with bravery, elan, and soldierly discipline. It's as though senior German, French, and British generals had a pre-war pact to make strategic decisions in massive ignorance of the facts on the ground. Asprey shows in detail how self-deluded senior generals on each side persisted in believing that the other side must be in even worse shape, so one more offensive should break through and shortly knock them out of the war. Censorship and appeals to patriotism only deepened the deception. The German public were lied to, thoroughly and systematically. Included in The German High Command at War are plenty of maps, many from Churchill's multivolume history of World War I. The Zimmermann Telegram gets a chapter, as does the introduction of tank warfare at Cambrai. Asprey gives interesting coverage of the struggle pro-and-con in the German government for unrestricted submarine warfare. Could Germany knock Britain out of the war before the British blockade starved Germany? Hindenburg and Ludendorff were strongly in favor, and helped unleash the submarines. Kaiser Wilhelm's martial poses and uniformed figure are often used to personify German militarism and the German war effort, but his incompetence to rule is developed clearly by Asprey. It is the world's tragedy that this personality ruled Germany from 1888 to 1918. Wilhelm's personal jealousy of and antagonism toward Britain (despite being a grandson of Queen Victoria) was a major contributor to worsening Anglo-German relations and ultimately to war. The Kaiser's public-relations blunders and a major homosexual scandal enhanced his misguided policies. Although Imperial Germany had a parliament, in effect the government was an autocracy. Bismarck once remarked that Wilhelm would like to have a birthday every day. Irreverent Viennese joked that "Wilhelm insisted on being the stag at every hunt, the bride at every wedding and the corpse at every funeral." The more difficult it grew to win the war, the more the Kaiser withdrew from operational involvement and even from policy direction. As the war struggled on, the generals gained power over policy, in effect political power. The autocratic basis of government eventually gave virtually free rein to the self-publicizing strong-men, Hindenburg and Ludendorff. Asprey labels this a military dictatorship. A characterization of this militarist spirit made around 1800 was that Prussia was not a country with an army, but an army with a country — as though the country's reason for existence was to serve as headquarters and food magazine for the army. Asprey presents Hindenburg's and Ludendorff's actions and words in detail to show that they fervently believed in the militarist be-all and end-all. Militarism wasn't enough. The strong-man empires proved politically weaker than the democracies in this crisis of unimagined proportions: millions of soldiers dying in battle and from injuries and disease, mutinies and desertion in the armed forces, civilians starving — revolution. 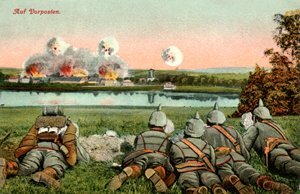 The governments of the German Empire, Austro-Hungarian Empire, Russian Empire, and Ottoman Empire all collapsed under the terrible pressure of the Great War. After the German defeat, Ludendorff participated in coup attempts against struggling civilian governments: the Kapp putsch in 1920 and the Hitler putsch (the Beer Hall Putsch) in 1923. As President, Hindenburg appointed Adolf Hitler to be Chancellor of Germany in 1933. These boosts were substantial for Naziism if not indeed essential and decisive; and before long, Hitler would hazard another Great War.